Statements - Statements are account summaries of all charges, payments, and invoices over a date range. 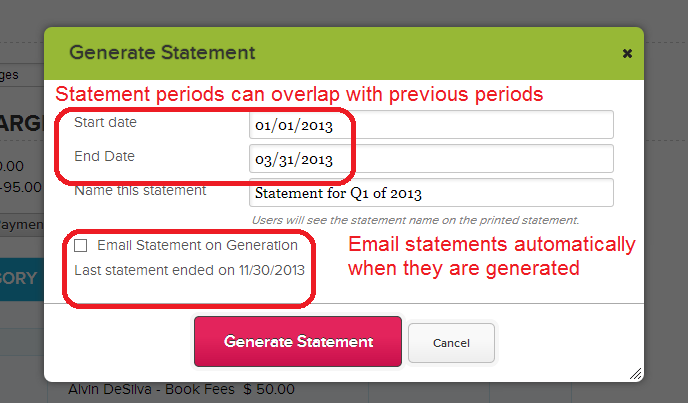 There may be multiple statements for a given account, and they may even overlap in their date range. It is impossible to create a statement a future date though - it only goes up to the current day. Statements may be generated and emailed and/or downloaded as PDFs. Invoices - Invoices are grouped charges. For example a Field Trip may include subcharges such as special transportation, destination admission, and/or food costs. These may be entered together as a "Field Trip" invoice charge. Invoices always function as debits from the account. PDF exports of a specific invoice are available but they cannot be automatically emailed. Invoices will appear on a student or family's billing statement. Both of these components are very important to Fee Tracking and they naturally go together. However, because of the language, they may be easily confused. To clarify, here's some information on generating both Statements and Invoices. Both Statements and Invoices are created from a student or family's billing account (statements may also be generated in mass from the main page in the Fee Tracking Module. The "Add Invoice" button and "Generate Statement" button are located right next to each other at the top of the Current Charges section of a student/family's billing account. You will need to select a start date and end date and enter a name. You will also have the option to Email the statement upon generation. When you create a statement, it will assign all charges to the statement and create an option for you in the "Statement" dropdown. Charges included in the statement will be hidden from the "Current Charges" view and only appear when you select their statement from the "Statement" dropdown. When you have a valid Statement selected, a Preview and Download button will appear on the right. Parents have a similar view in their parent portal (as do students, if you have student billing turned on). Parents can also select a specific statement to view, preview as pdf, or download. Parents cannot create statements or add charges, invoices, or manually entered payments. 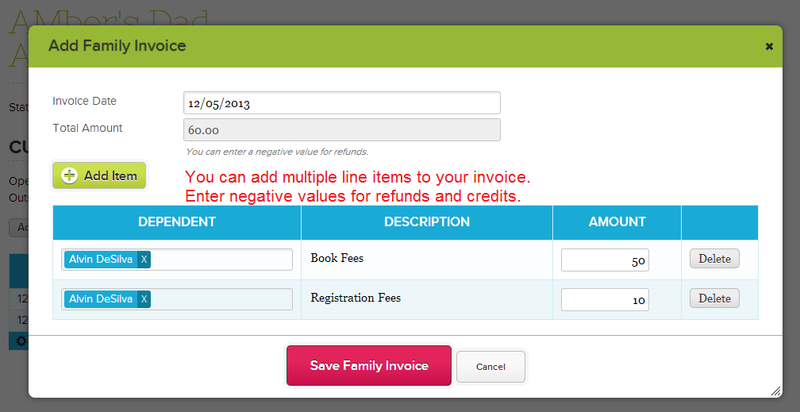 Admins use the "Create Invoice" button to add a grouped charge (invoice) to a student or family's billing account. Simply fill in the box that appears - you'll need to set a date, click "Add Item" and fill in the line item that appears in the table at the bottom of the dialog. If you have Family Billing, you'll need to select the name of the Dependent who is being charged. In the Description column, simply fill in a short summary of the line item, then add the amount in the far right column. The Total Amount will be automatically summed. When you are done, Save the invoice. We hope you like these Features. As always, if you have any feedback for us, please let us know!